The Hanged Man (XII) — the twelfth card of the Major Arcana — indicates that you are at a crossroads and need to let go of the past in order to arrive at your new reality. Getting there is something you strongly desire, yet it will likely involve a certain amount of sacrifice. While the Hanged Man might at first appear to be a bad omen, this isn’t necessarily true. Even though the card depicts a man dangling upside down from a tree with his hands behind his back, there is a halo-like light around his head, similar to how saints were depicted in art stemming from the Middle Ages. This could suggest martyrdom, but the expression he wears is not of sadness or dismay, but rather of contentment, indicating he is at peace with his situation. The tree he’s hanging from by one ankle is part of the living world, reaching up to the heavens, while its roots, by contrast, remain deep in the underworld. The serene look on the Hanged Man’s face suggests he is there by his own will, and while his right foot is bound to the branches, his left foot remains free. His hands are behind his back in a position creating an inverted triangle, which can be interpreted as being symbolic of his power to manipulate his current situation. His red pants symbolize the physical body and passion, while the blue of his shirt represents calm emotions, the red-blue color combination again commonly associated with Catholic saints. The Hanged Man recognizes that the position he’s in is one of sacrifice, possibly to repent for past sins, or a calculated step back to reassess his next move forward. This is far from wasted time, however, as the Hanged Man understands that he’s simply waiting for the right opportunity to come along, and until it does, his path forward will remain suspended. He’s confident — perhaps overly so — that he will recognize this opportunity whenever it presents itself, so for the time being he’s more than fine just waiting it out. The Hanged Man card can also represent indecision, and as such he is at risk of not recognizing these opportunities when they do come to him. Consequently he remains forever in limbo, trapped in his indecision, his primary action being non-action. The Hanged Man in an upright position indicates that you are in an unhappy situation, stuck in a rut or a negative state of mind you need to free yourself from. It can also be interpreted as uncertainty over which path to take. Consider stepping outside of yourself for a minute to change your perspective and figure out what is stunting your progress. If you are in a relationship, the Hanged Man is suggesting you may be more unhappy with your partner than you realize. While it might be painful, it’s time for you reconsider your relationship and possibly bid a fond adieu to your current lover. At the same time this card could be a warning that your partner is feeling this way towards you and accessing the relationship from a new perspective themselves, deciding if it’s worth continuing. This isn’t necessarily a negative, as your partner could be realizing that they’ve wronged you in the past and want to rekindle the romance. If you’re single, drawing the Hanged Man could be an indication that you need to let go of people, thoughts, or situations that are keeping you unhappy. If you still yearn for an ex-lover, the Hanged Man is telling you that it’s time to let go of these feelings, that at this point they represent a negative thought pattern that only brings you pain. You may be stuck in a rut and sick of your job or career. Now is the time to see if there is realistically anything you can do to change the situation. If there isn’t, then you need to step back and bide your time for the moment, things will eventually change for the better — just maybe not quite as soon as you hope. This could be good time to start looking for a new job or line of work. Now is the time to reassess your relationship to money. If you’ve been stingy, start sharing some of the wealth — doing so could be more beneficial than you think. Alternately, if you always seem to be picking up the tab for everything, sit back and let someone else do it for a change. Essentially, you need to do the opposite of what you’ve been doing with your wealth. As with your finances, it’s time to approach health and fitness from a different perspective. For instance, if you’ve been working out with weights at the gym, perhaps it’s time to add something like yoga or tai chi to your routine. With respect to your physical health, the Hanged Man is telling you that everything is fine and not to worry about that which you cannot control. Have you made any recent decisions that are giving you second thoughts? The Hanged Man in reverse is telling you that you may have made a bad choice but there might still be a chance to go back and right your wrongs. 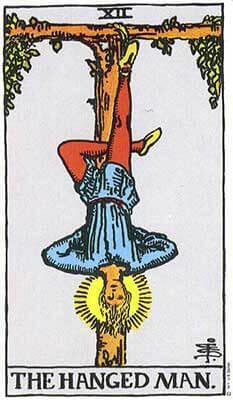 In this position the Hanged Man indicates that you’re jumping from one bad situation to the next without properly thinking things through, and that your impulsiveness hasn’t been doing you any favors. Take some time out to consider why you’ve been acting this way, then go back and try to repair any damage you may have caused. If you are in a relationship, the Hanged Man in a reversed position indicates it could be in serious trouble. Yes, your love life may still be salvageable — but not if you aren’t prepared to confront the problems facing you. Perhaps you’re afraid of being alone or having to start all over again with someone new. Don’t be. If you’re single, the Hanged Man is telling you to stop making the same relationship mistakes. It’s time you started learning from them if you want to find a new mate and have healthier relationships in the future. The Hanged Man is informing you that your career has stalled because you lack the will or resolve to address the issues responsible for your stagnation. It’s time to reclaim control of your professional life. Don’t let the fear of potentially negative consequences hold you back, you only need to look at your financial situation from a new perspective and everything will be fine. Consider visiting a financial specialist and see if they can provide you with some new insight. If your health has been suffering, the Hanged Man is suggesting you find new ways of dealing with what ails you. If you’ve been restricting your health care to your family doctor, it might be time to start thinking outside the box a little — consider supplementing treatment by visiting a naturopathic doctor, a TCM practitioner, a chiropractor, nutritionist, or another alternative health provider. 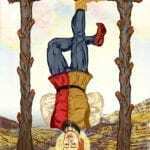 Drawing the Hanged Man in the present position suggests you are unhappy with your current situation, and that you feel trapped in your immediate circumstances or frame of mind. The good news is that you have the power within to escape your unhappy situation. You just need to step back a little, relax, stop trying to control everything all the time and do your best to look at your dilemma from a different perspective. The way forward will make itself apparent in due time. In the past position, the Hanged Man card indicates that you’ve finally managed to let go of the lingering negative memories you’ve been harboring all these years, and that this has proven beneficial to you spiritually. You can now safely look back at these experiences from a fresh perspective. In the future position, the Hanged Man tells you that things remain uncertain, so be sure to plan your next moves carefully. If you’ve been hurried and rushing lately, you should relax and give pause to the situations around you. The Hanged Man is a strong, dominating card in any combination. It is especially meaningful when paired with Sword cards, which can be a sign of internal conflict or aggressive external forces. Together, the Hanged Man and the Two of Swords caution you against putting off until tomorrow what you can do today. There is more to fear from avoiding change than there is from facing it. This combination works like a pat on the back — you have more to offer than you often forget to realize. Persevere and aim high. You will be pleasantly surprised by the outcome. When these two cards are paired, they indicate that you need to acknowledge the gift that is your superb powers of observation. They are well beyond the norm and can be used to help not only yourself but others as well.